ChargeAll breaks the mold on portable batteries, you can now charge just about anything(within reason) anywhere you are! On demand power everywhere you go. Say goodbye to the days at your local coffee shop looking for a open outlet and can't find a free outlet charge it with ChargeAll. I wish they had a 25,000mAh option and then it would just be heaven! If you decide to back them please use this link, please leave a comment on their campaigns comment page that you found their project through IamABacker.com , Thank you. Have you ever wished you could take the wall outlet on the go? ChargeAll gives you the power to do things you never thought possible; power up and charge your cell phones, tablets, digital cameras, fans, curling irons or desk lights! Yep, you read that right, curling irons! It's so small and compact you can literally put it in your pocket, your purse or your backpack. Available in two sizes: Portable (Small) and Powerful (Large). Press the share button right below our video and send it to all your friends and family. For each portable power outlet purchased through your link, we'll give you a $10 refund of your purchase price. This means if just 5 of your friends each buy just one portable power outlet, you'll get a whopping $50 off your pledge cost. Likewise, if 1 of your friends buys 5 portable power outlets, you'll get the same $50 off. So go on, share the gift of power and we'll make sure your good deed doesn't go unnoticed. You'll be on your way to a free ChargeAll in no time! Wherever you go, so should your portable power outlet. That's why we designed the battery to be lightweight and convenient to bring around. Stay connected and stay powered up in all of your daily activities. ChargeAll is meant to blend in with your lifestyle and will always be with you. Millions of devices. Your laptop computer, Apple Macbook, iPad, iPhone, Android, GoPro, Samsung Galaxy, DSLR, remote controlled helicopter, fluorescent lamp, curling iron, electric fan, bluetooth speaker, flat screen TV, gaming devices, Sony PSP, Nintendo 3DS, WiiU and much more. It's a portable power outlet, so pretty much anything with a wall plug under 85 watts. This battery pack is 5.95 x 3.7 x 1 in. and contains enough power to charge your phone for an entire week or fully charge your laptop multiple times. In terms of size, it's almost comparable to that of an iPhone. The edges of the plastic housing are rounded, making it easy to hold and carry around. It includes a power outlet as well as a USB port which means charging or powering up any device can be convenient anywhere. We know there's options out there, but NOTHING compares to the portability and power of ChargeAll. Think about those gigantic powerful generators that are perfect when the power goes out, but not practical to carry around. Or how about that portable lipstick charger that only works with your phone, but not powerful enough to work with your laptop computer or anything else that requires an electrical outlet. That's why we created ChargeAll, it's the perfect blend of size and power. Choose your size. The portable power outlet is the small size (12000 mah) and the powerful power outlet is the large size (18000 mah). The large size has 50% more capacity than the small size. It also has an additional two USB ports and battery capacity indicator. ChargeAll is beautiful and compact. It is fully mobile and will fit in your backpack, purse, and even in most pockets. With ChargeAll, you will have power within arms reach wherever you are! We recognized a problem and carefully thought out a solution. There's so many different portable battery packs out there, but they're limited to charging only USB powered devices. The real solution is to have an electrical wall outlet that can power up virtually everything. We spent time carefully creating 3D models and renders to fit the internal lithium ion batteries and also provide contact for the portable power outlet. Again, ChargeAll had to fit in with your lifestyle and something proud you could carry around or give to all your family and friends. Sleek design, rounded edges makes it easy to hold, even for people with small hands. As with all design projects, the 3D printed prototypes were tested during real life situations. People of all ages were asked to carry around the unit and provide feedback. Iteration after iteration, we finally found a size that allowed for the internal components to seat comfortably. What we achieved was the most efficient way possible to store a large capacity of power while still adhere to high safety standards. We wanted more power, but less bulk. Most products fail in execution because the engineers/designers fail to realize the technological hurdles they will need to overcome during production. We worked closely with our manufacturing partners. Having a great product design concept is one thing, but having a product that actually works, is most important. Many times have we come across products and concepts that do not understand the limitations and specific procedures of manufacturing. That's why we made sure we partnered with a manufacturer that understood our most important wants and features. We worked with our engineers to design an IC board that combines both the electrical outlet and USB port component. This was the biggest puzzle, a configuration that would work physically as well as aesthetically for the exterior design and overall layout for the lithium ion cells. In the end, we created something amazing. Or should we say, what can't you charge? Any electrical wall outlet device under 85 watts. Check the manufacturer's specifications for more information. If you are using a device with a variable setting, use the lowest for your safety. Field tests were conducted with different household products under the recommended 85 watts limit. The actual results may vary. There are limitations, only devices that require less than 85W of power can be powered. It is not possible to use high power demanding electronics, such as a microwave. An internal safety fuse will cut the power and shut off your energy pack if done so. We embedded this safety feature to protect someone from getting hurt. After the safety cut-off has been triggered, simply recharge the device again to resume operation. **Actual charge and run times will vary. Divide 12000 mah or 18000 mah for an approximate number of charges you can expect from a fully charged small or large ChargeAll. Developing cutting edge technology isn't easy, and it's also very costly/time intensive. With your support, we can finally hit mass production and meet the factory's minimum order quantities. We choose our manufacturing partner based on their long track record of producing high quality portable battery chargers. Current Progress: We already have fully functional versions of both the portable and powerful from our manufacturer overseas. The overall build is excellent and identical to what would be the mass produced version. Manufacturing Production Plan: A large cash outlay is always required to start production. Plastic molds, high quality battery cells and circuit boards need to be purchased upfront. With the support of the Indiegogo community, we can finalize our designs and start manufacturing. The Final Product: A portable and powerful battery pack with an AC wall plug outlet. Power in the palm of your hands. Has your cell phone died when you needed it most? ChargeAll was founded on the idea of solving the low battery problem. Headquartered in Newport Beach, CA, the company is best known for their phone charging stations. Their products can be found in thousands of locations around the world including Hilton hotels, McDonald's restaurants, Kasier Permanente Hospitals and Toyota car dealerships. Shouldn't free cell phone charging stations be everywhere? We believe that "The World's Most Portable AC Outlet" will change the world; empowering people to do things they never could before. It brings convenience into people's everyday lives. We consider the Indiegogo community a part of the ChargeAll team, and hope to see our vision of portable power become a reality. What devices are supported? Can it charge anything? Like we stated above, the battery pack can charge any phone plugged into it via USB. In terms of the AC outlet, the small pack can support up to 12000 mAh and the large pack can support up to 18000 mAh max. Anything above the max capacity will trigger a safety mode where your pack will shut down. Recharging will then be required to reuse the battery pack again. How long can this device charge for? It really depends on how much power your devices use. When comparing the 12K to the 18K, the 18K can provide about 50% more charging power than the 12K. Do not drop, or place heavy weights on top of the battery. Never try to open the battery case or make your own repairs. Do not expose to rain or moisture. Keep away from moisture and humidity. Do not expose the battery to high temperatures. Do not charge the battery with anything but the recommend AC wall charger. One of the biggest challenges is the manufacturing process. Quality control will be at the top of the list and most important issue. There are many reasons why the manufacturer's cooperation will not be easy. 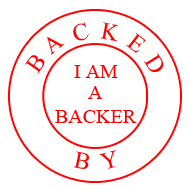 We understand that Indiegogo backers want their product as soon as possible, but we are limited by factory's capabilities. In our experience, most pre-production samples still have a slight variation from the final mass produced unit. for ChargeAll - World's Smallest Portable Power Outlet and the team!